This powerful, life-size female figure is a Hindu goddess known as a yogini. Hindu devotees worshipped yoginis as embodiments of female energy (Shakti), an energy that could be as ferocious as it was benevolent. 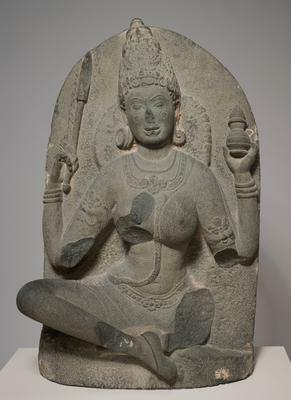 This yogini was once enshrined in a circular, open-air temple with at least fifteen other goddesses. She has four arms, indicating her divine status. Her upper arms are holding what might be a jar of medicine and a wand for dispensing the medicine, suggesting her health-giving capabilities. Her now broken lower left arm would have held an outstretched skull cup for drinking liquor or blood. Yoginis were believed to possess powers of flight, to which the lightly incised bird underneath her right foot might allude.